Constructed at Wolverton in 1934, 7511 is one of Sir William Stanier's earliest new developments for the LMS. Built as dual-purpose vehicles, these coaches were used for ordinary First class passengers on principal expresses, and when required could be laid up for use as a dining car. The earliest batches, which include 7511, were turned out in fully lined LMS livery as standard on the older timber panelled coaches. These sleek modern-looking vehicles were unbelievably painted to look like the older stock. 7511 ran on passenger services until about 1960, when it was withdrawn and stripped out for use as a mobile carpet showroom, and sold to a Kidderminster company, Gilt Edge Carpets. Two vehicles were used to tour the country at a time when trade reps with cars were not so common. These two vehicles were then sold for a nominal sum to the newly-formed SVR in 1969, and 7511 was then kitted out as a dormitory for use by volunteers at Bridgnorth. After eighteen years static use at Bridgnorth, 7511 was replaced and sent back to Kidderminster, and stored for twelve years. 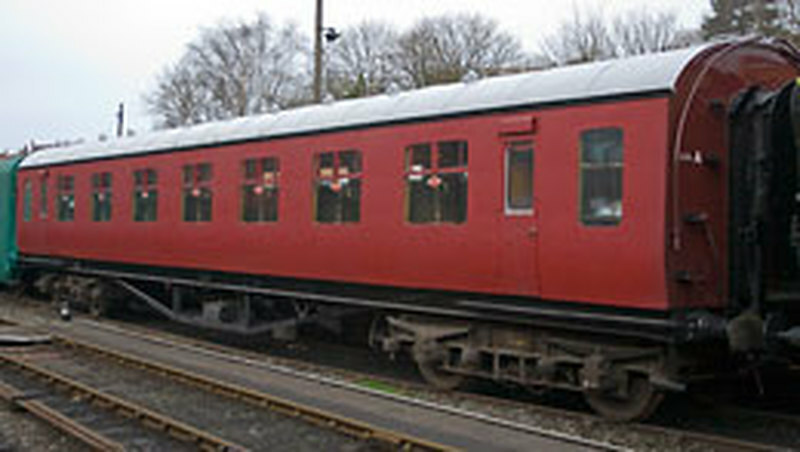 The LMS&BR Coach Fund purchased the coach for five pounds in 1999, and set about fund-raising with a view to restoring it. Components from a similar vehicle, No 7571, were retrieved from Butterley, Derbyshire, and about half of that material has been used to reinstate seating and walls. Rotten and missing material has been faithfully reproduced, using drawings, samples and photographs, to ensure accuracy. The restoration is of a very high standard, and completion is due after nine years work, early in 2009. The whole project had cost around fifty-five thousand pounds by the end of 2008. 7511 is intended for use in dining car services on the SVR, and will be the first LMS vehicle on the SVR to carry the gold-leaf with vermillion lining style it was built with in 1934.